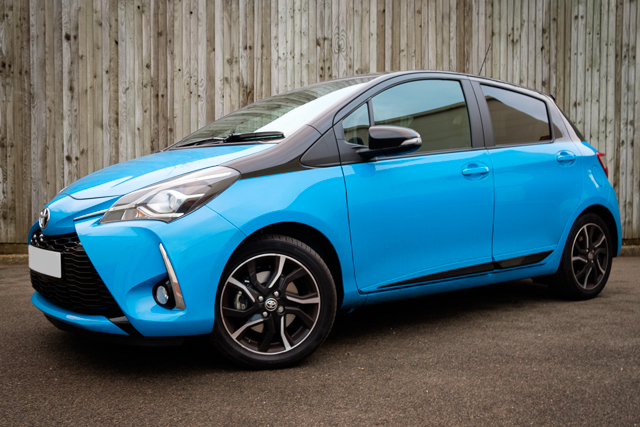 Meet the replacement for Jen’s Fiat 500 – a Toyota Yaris Bi-Tone in “Cyan Splash” blue! As much as we all loved the 500, or “Mummy’s white car” as Owen called it, Jen really needed something a bit bigger, with 5 doors. We were also a matter of months away from running three cars over ten years old. Cars which seem to have a knack for breaking down at the same time. We did a tour of local garages, but as soon as we saw a Yaris identical to this one at the Toyota dealer Jen was smitten. The good news was that the Yaris ticked all the practical boxes – it feels bigger inside than my BMW, and fits Owen’s pushchair in the boot. I also discovered that in What Car’s 2018 Reliability Survey, the petrol Yaris got a perfect score – no owners reported any faults! The bad new was that the colour that Jen liked was only available on the top of the range model, which was over budget. It was only when we got home that Jen discovered that the dealer had a few pre-registered ones on the forecourt with less than 100 miles on the clock and priced nearer her budget. The technology in the Yaris is a big step up from the 500 – most importantly for Jen it has DAB and Bluetooth music streaming, without me having to modify the audio system! However I think some of the spec choices from Toyota are a bit strange – auto dimming headlamps, but no auto lights for example. Even my fourteen year old BMW has that! I am glad that Toyota didn’t use their standard clock module, which seems to have been used on most of their models in the last twenty years – the one with the pointless “:00” button, that is in my MR2 Roadster. The controls on the Yaris seem very sensitive, I find it harder to drive smoothly than the 500, especially if I’ve just jumped out of one of my cars, which require far more input. The brakes are especially sharp! We haven’t been on any adventures in the Yaris yet – for the first few days it was tucked away in my garage, so that I could give it a thorough detail and protect the paint with Soft-99 Fusso wax, and other than a trip to Blenheim Palace, we have just driven it locally. However now that we have a choice of cars for family outings I am sure it will get used more than the 500 was recently! I had been meaning to borrow the Yaris for a proper shoot, however my lack of free time and shorter days have conspired against me. I was able to grab this shot whilst I was out in the car. I only had my Fuji X-T2 and new 23mm f2 prime lens with me, so it was a case of park up, frame the shot, click and drive off in a couple of minutes. I am looking forward to doing a proper shoot at some point though. The lease deal on my MX-5 is coming to an end, so it was time to search for a new car. Jen and I had been toying with the idea of driving down to the Historic Grand Prix of Monaco, so I had been looking for something suitable for a two week roadtrip around Europe. However, nothing with storage space and in budget caught my eye, but I kept getting drawn to the little Toyotas with no boot! After looking at a few with Jen and confirming that the storage space (behind the seats) would be enough for a weekend away, I saw this one, which had fewer miles and was in much better condition than the others – so I bought it! As I still have my MX-5 for a few more weeks, the MR2 is going into storage – but I got it insured for the day to drive it home and it would have been rude not to take it for a run out! The first trip was to Tesco – I can confirm that it can fit a large weekly shop in the storage bins. Then we went for a picnic at Broadway Tower near Evesham. Broadway Tower is an old tower and country park, on the A44 between Evesham and Moreton in Marsh. Aside from the great views, free parking and cafe the other attraction to Broadway Tower is that the road to get to it, known as Fish Hill has some great alpine style hairpins, so was a good place to test out the new car – don’t worry, my standard Melton Mowbray and Uppingham test will happen when I get it out of storage! The return journey, through the Cotswolds, was a good comparison with the MX-5, as I’d driven that route last month on the way back from Croyde. The MR2 isn’t as refined as my mk3.5 MX-5 (more refined than my old mk1 MX-5 though), but being lighter, mid engined and more powerful, the handling is better than either and I can carry more speed through corners. I’m going to have to take it on a track day to see what it can really do! That will have to wait until it is back out of storage and in the mean time I’m going to make the most of my remaining time with the MX-5!